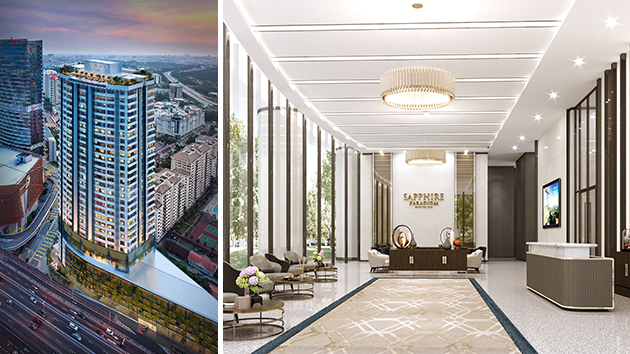 Sapphire Paradigm is a chic residence in Petaling Jaya for trendy urbanites, with an amazing skyline view of north Petaling Jaya and Kuala Lumpur. Well-connected and easily accessible via the Lebuhraya Damansara-Puchong (LDP) and adjacent to the Paradigm Mall, New World Petaling Jaya Hotel, the MSC-status Ascent Tower, and The Azure Residences, Sapphire Paradigm is truly the one-stop location of stay, rest, work and play. Soaring at 29 stories high, its iconic tower features with chic architectural for exquisite living. Sapphire Paradigm awaits the discerning upmarket families and young urbanites seeking to embrace a wholesome lifestyle living concept. Low-density at 229 residential units. Located adjacent to the popular shopping destination, Paradigm Mall Petaling Jaya. Strategically located next to Lebuhraya Damansara-Puchong (LDP) and multi-access via North Klang Valley Expressway (NKVE), Sprint Highway, Penchala Link and Federal Highway. Free daily shuttle via Rapid KL to and fro Paradigm Mall and Kelana Jaya Putra LRT station (hourly from 9am to 11pm). Every floor comprises ten (10) units that are served by four (4) lifts and a separate service lift.